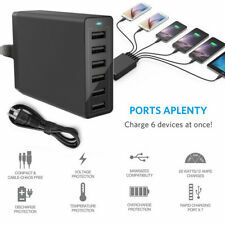 Features 100% Brand New and High Quality 5-ports smart charger design It can charge for 5 devices at the same time With Smart chip, intelligent management Red and blue LED display Safe and fast charging Widely compatible with most of the devices Item Specifications Material: ABS PC fireproof plastic Product Type: Direct Charge Input: AC 100~240V~0.5A(1.0A)50-60Hz Output: DC5V 4A (single port output up to 2.4A) Plug Type: UK Packing list 1 x 5-port USB Charger. 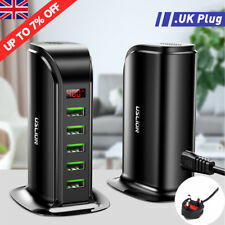 Features:100% brand new and high qualityLarge LCD Diplsy Adapter Charger With 8 Port!! 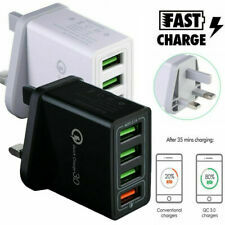 !Quick charge technology: 8 usb port travel charger, no need to wait!! 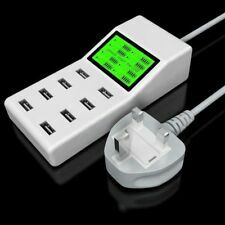 !8-Port USB Charger: can charge up to 8 devices simultaneously, suitable for various cell phones, iPad, mp3, and so on. Charging together without any mutual interference! !Charging Safety Guaranteed: Short circuit protection, overcurrent protection, overvoltage protection, over temperature protection, anti-static protection,Multi-layer charging protection to ensure equipment safety during each chargeABS flame retradant material, high temperature resistance100-240V worldwide universal voltageSmart IC chip output, more protectionReal-time current, Real-time voltage, battery level to show charging processComp. With a smart LCD screen to show the charging status of every USB port intuitively. Number of usb port : 8. It seems that the power of these electronics is never enough. If there is a product that is portable, and can charging different devices synchronously, do you think it’s worthy to own one?. We will always here to solve them for you. It won't help the problem to be solved. Interface: 4 USB. A main board. Material: ABS PC Fireproof Material. Single weight: 460g. Pls touch us first before you leave Neutral. Plug Type: UK Plug. Safe and fast charging. With Smart chip. Output: DC5V 4A (single port output up to 2.4A). Specially family-sized design fits perfectly on your desk or nightstand, or easily take it while travelling. Sound & Vision. Tired of waiting for your turn to use the outlet?. 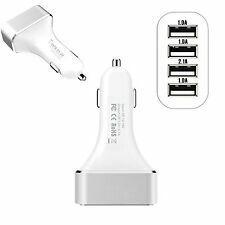 6 USB Charging Port. Compact family-sized (3.8 x 3.1 x 1.2in) shape, unibody design, fits nicely near your workstation, nightstand or even the entryway desk - creating the perfect charging hub for your gear or the family's. With the AIpower seven-fold protection function, it will automatically recover when the load is normal to ensure the safety of use. 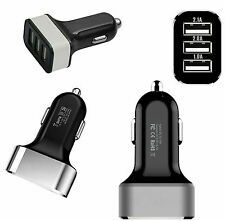 It greatly reduces the slow charging speed of on-board charging devices. Fire-resistant and hardened plastic outer shell for durability, build-in premium circuitry and microchip ensure device safety. Support all 5V output devices based USB interface, 50 watt for stable and high speed charing. A total of 10.0A50W output. This product features novel and stylish design. All for your safe use. Specifications:UK plug. 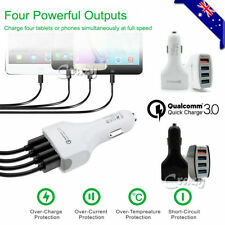 Number of connectors: 6 outlets (for iPad, iPhone, Androids, etc).